Understanding the relationship between the physical and biological processes is crucial for predicting the marine ecosystems response to changes in the climate system (McGillicuddy et al 2007). Vertical motion associated with mesoscale and sub-mesoscale features such as fronts, meanders, eddies and filaments plays a major role in the exchanges of properties between heat, fresh water and biogeochemical tracers the surface and the ocean interior are of fundamental importance for the exchanges of between the surface and the ocean interior (Klein and Lapeyre 2009). Modelling studies of frontal regions (Mahadevan 2006) suggest that vertical exchange is enhanced at density fronts. Unfortunately, it is not yet possible to make direct measurements of vertical velocities of values less than 1000 m/day. Instead, it can be inferred from a 3D field of the density field in the quasi-geostrophic formulation (Tintoré et al. 1991). One of the key problems that has to be faced when trying to obtain accurate estimates of the vertical exchanges from observations is related to the availability of high resolution data. The wide-swath SWOT altimeter with a resolution one order of magnitude higher than can be resolved from present altimeters, will allow first-time observations at shorter scales than 100 km (Fu & Ferrari, 2008). To anticipate the 2D SSH fields that will be provided by SWOT and to monitor and establish the vertical exchanges associated with mesoscale and sub-mesoscale structures and their contribution to upper-ocean interior exchanges, multi-sensor synoptic observations need to be collected. In situ systems, including R/V (CTD, water samples, ADCP), gliders and drifters will be coordinated with satellite data to provide a full description of the physical and biochemical variability. The observational approach must be integrated with numerical simulations both realistic and process oriented studies. The general objective of MULTI-SUB is to quantify and improve our and understanding of vertical exchanges associated with oceanic mesoscale and sub-mesoscale features (e.g fronts, meanders, eddies and filaments) through the combined use of, in-situ and satellite data in synergy with numerical models. The ultimate goal is to enhance our understanding of the impact of finescale processes on biochemical variables. We will focus on a range of scales (30-100 km) traditionally not resolved by conventional altimeters. To achieve the general objective, several multi-sensor experiments will be designed and conducted with the aim to address the following questions. What are the physical mechanisms that drive observed biochemical patterns (glider, CTD and samples)? What is the relative importance of each of the processes? And how do they interact? Different mechanisms will be analyzed such as horizontal advection, quasi-geostrophic mesoscale vertical exchanges, Ekman pumping (linear/non-linear), Frontogenesis (sub-mesoscale). The MULTI-SUB project plans to study, from an interdisciplinary point of view and using a multi-sensor approach, the impact of vertical motion associated with mesoscale and submesoscale signals on biochemical properties. This approach is necessary to elucidate the existing uncertainties of the impact of mesoscale eddies on ecosystem dynamics. This proposal is thus an ambitious and fundamental research initiative and the group has previous experience in some of the aspects involved. The approach chosen to achieve the MULTI-SUB objective presents several original and innovative elements, related to the methodologies proposed to collect and analyze the physical and biological data. A unique aspect of MULTI-SUB is the combination of concurrent multi-scale ship-based, and satellite observations with adhoc modeling simulations, enabling the evaluation of the underlying mechanisms responsible for the observed patches of ocean chlorophyll retrieved from underwater gliders. The project will benefit from additional existing data sets generated in the frame of EU, ONR (US) and Spanish funded projects. This project has a strong observational component. Within MULTI-SUB, we propose to conduct two synoptic high-resolution multi-sensor experiments. In situ systems, including gliders, drifters, CTD, ADCP, water samples and HF radar, will be coordinated with satellite data and modeling simulations to provide a full description of the physical and biochemical variability. The final goal is to monitor and establish the vertical exchanges associated with mesoscale and sub-mesoscale (e.g fronts, meanders, eddies and filaments) and their contribution to upper-ocean interior exchanges (Mahadevan and Tandom 2006). We will select two distinct areas in the Western Mediterranean to contrast different regimes of vertical velocity. On one hand, the eastern Alboran Sea, an area characterized by intense gradients that lead to the appearance of marked mesoscale and sub-mesoscale features (Ruiz et al. 2009; Pascual et al., 2017). We will also consider the Balearic Sea with a moderate background mesoscale signal (Mason and Pascual, 2013). Each of the experiments will include an initial large scale sampling (that will cross the feature of interest (i.e. eddy or front) at a horizontal scale typically resolved by conventional altimetry i.e. order 100 km) and further, in a second phase, a high resolution sampling including multi-sensor approaches (see examples of previous experiments in Figure 1 and Figure 2) will be performed to recover the small scales to be observed by SWOT. Figure 1: Example of multi-sensor experiment in the Balearic Sea: From: Pascual et al. (2010). 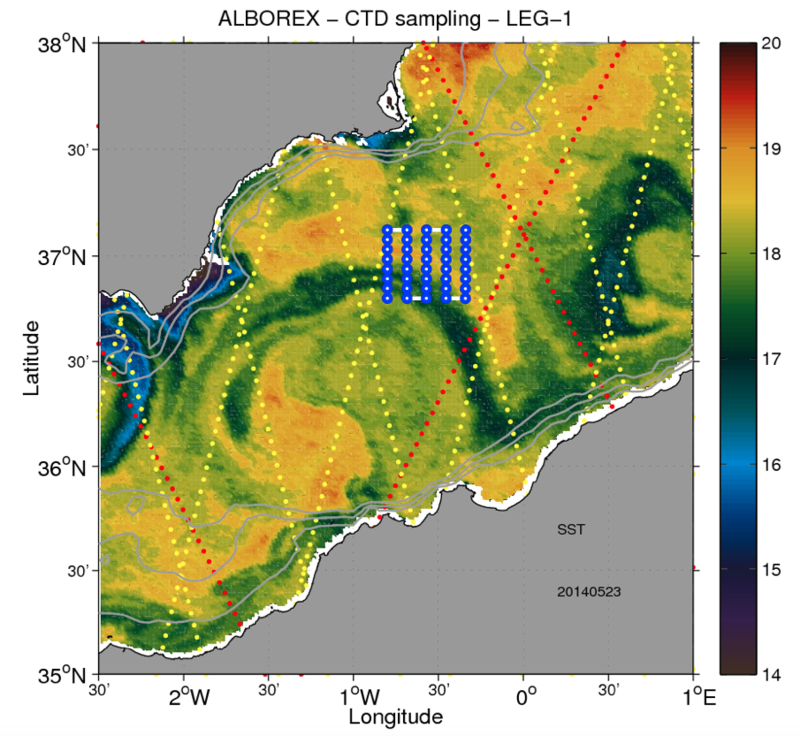 Figure 2: AlborEx multi-sensor experiment in the Eastern Alboran Sea (Pascual et al. 2017). In this figure we present the CTD sampling. The color field corresponds to an SST image for 23 May 2014. The Jason-2 and SARAL/AltiKa tracks are plotted in red and yellow, respectively. Isobaths are: 200, 500 and 1000 m.
In addition, the SWOT simulator software package will be exploited to generate SWOT-like outputs for the western Mediterranean using numerical modeling inputs from CMEMS. These data will complement both the existing lower resolution altimetry and the high resolution observational data that we collect, with the aim being to learn how we can use SWOT in understanding variability at meso- and submesoscales. MULTI-SUB will contribute towards improving our understanding of the net effect of mesoscale variability on water mass formation and transport at the global scale, as well as on its impact on biochemical tracer redistribution and consequent marine ecosystem response. Observed Sea Surface Height fields at various scales (low and high resolution) from a multi-sensor approach. Derived variables (geostrophic velocities, vorticity, QG vertical velocity, Ekman pumping, frontogenesis) from both observations and numerical simulations. Intercomparison of mesoscale and sub-mesoscale vertical exchanges. Better understanding of in-situ observations by isolating mechanisms using a numerical model that would aim to resolve vertical transport at the fronts. The proposed activities will have a relevant impact on the use of SWOT jointly with other altimeters (Jason-2, Jason-3, Envisat, Sentinel-3 and OSTM/Jason-2) and in situ data and models in support of physical and biological oceanography research. The tasks proposed within MULTI-SUB will contribute to increasing our knowledge of the relationships between physical and biological processes in the upper ocean, which is essential for predicting how the ocean and marine ecosystems may respond to changes in the climate system. Fu and Ferrari, 2008, EOS and the SWOT Science Requirements document (April 2014: https://swot.jpl.nasa.gov/science/. Klein P. and Lapeyre, G., 2009: The oceanic vertical pump induced by mesoscale eddies. Annual Review of Marine Science, 1, 351-375. Mahadevan, A.: Modeling vertical motion at ocean fronts: Are nonhydrostatic effects relevant at submesoscales?, Ocean Modelling, 14, 222-240, 2006. Mahadevan, A., A. Tandon, An analysis of mechanisms for submesoscale vertical motion at ocean fronts. Ocean Model. 14, 241 (2006). McGillicuddy, D.J. et al., 2007: Eddy/Wind Interactions Stimulate Extraordinary Mid-Ocean Plankton Blooms. Science, 316(5827): 1021-1026. Mason, E.; A. Pascual. Multiscale variability in the Balearic Sea: An altimetric perspective. Journal of Geophysical Research C: Oceans. 118 - 6, pp. 3007 - 3025. 2013. Pascual, A., Ruiz, S., Tintoré, J., 2010. Combining new and conventional sensors to study the Balearic current. Sea Technol. 51 (7), 32–36. Pascual A, Ruiz S, Olita A, Troupin C, Claret M, Casas B, Mourre B, Poulain P-M, Tovar-Sanchez A, Capet A, Mason E, Allen JT, Mahadevan A and Tintoré J (2017) A Multiplatform Experiment to Unravel Meso- and Submesoscale Processes in an Intense Front (AlborEx). Front. Mar. Sci. 4:39. doi: 10.3389/fmars.2017.00039. 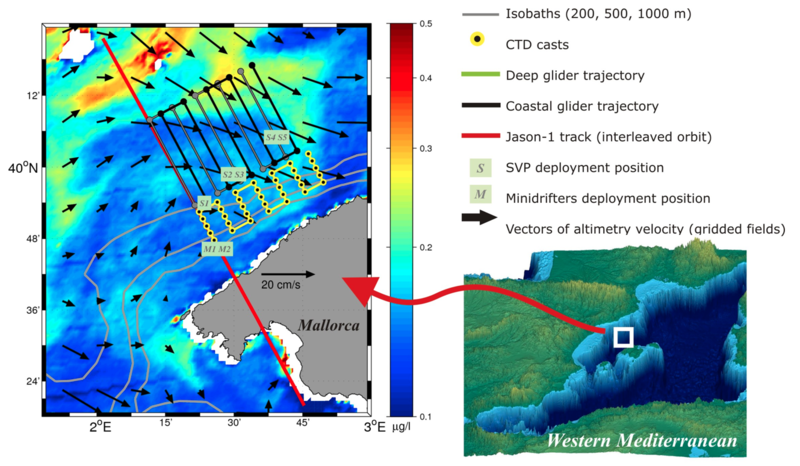 Ruiz, S., A. Pascual, B. Garau, M.-I., Pujol, and J. Tintoré, Vertical motion in the upper ocean from glider and altimetry data, Geophys. Res. Lett., 36, L14607, doi:10.1029/2009GL038569, (2009). Tintoré, J., D. Gomis, S. Alonso, and G. Parrilla (1991), Mesoscale Dynamics and Vertical Motion in the Alborán Sea, J. Phys. Oceanogr., 21(6), 811–823, doi:10.1175/1520-0485(1991)021<0811:MDAVMI>2.0.CO;2.